According to the latest issue of the Red Book of Ukraine published in 2009, the total estimated number of Short-toed Eagles in the country is equal to 250-300 breeding pairs. There are no data about essential decrease or increase of the population until now. The main part of it is distributed in the forestlands of Northern Ukraine, so-called Polissya, as well as in some places of the forest-steppe zone. Significant areas of the regions are covered by the wetlands. They are traditionally utilized by the species as foraging grounds. Commonly, Short-toed Eagles are summering in southern part of the country, but not breeding, with rare exceptions, due to lack of forests convenient for nesting. 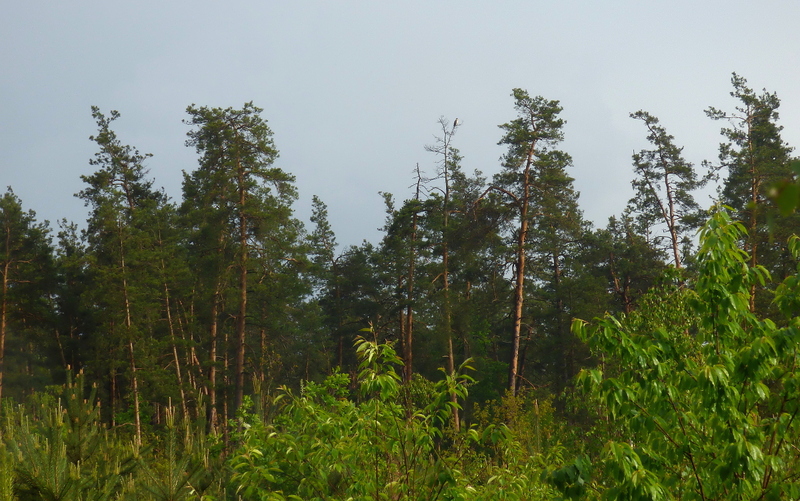 Like in other regions of the species range, the main threats for the Short-toed Eagle future in Ukraine are the transformation of hunting grounds because of agricultural activities, and felling old pines in the process of forest management. These factors are intensified because of high profitability of those two branches of the economy in conditions of the current hard economic situation in Ukraine and, on the other hand, a poor control from the government side at both the legislation and executive levels. 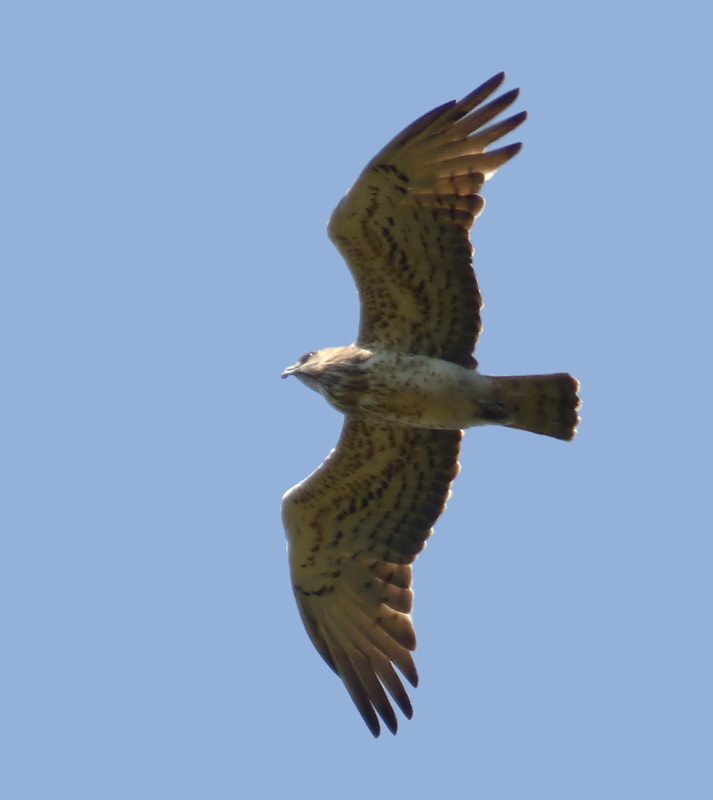 A negative effect of the agricultural expansion on the entire Short-toed Eagle population within the country cannot be estimated properly, because only few pairs of the species are under constant monitoring, and their home ranges are situated in those areas where that effect should not be critical. 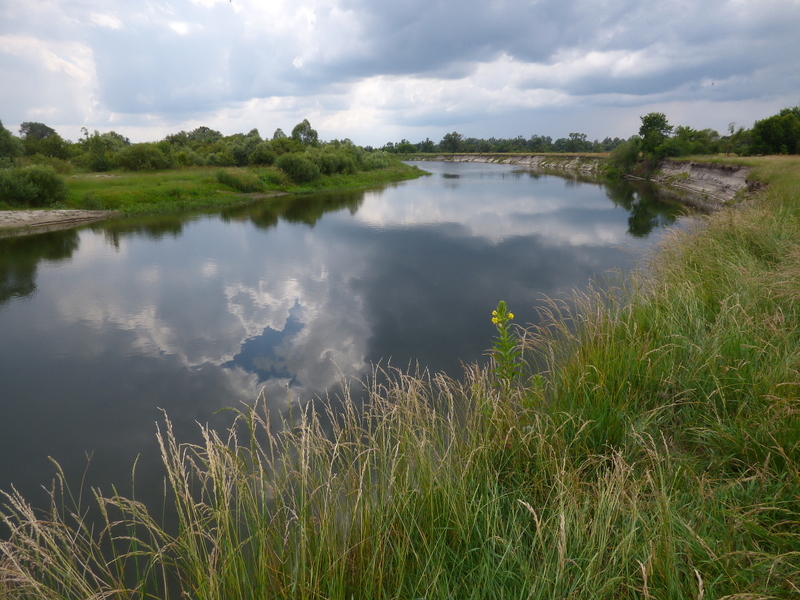 The strongest negative influence of agricultural activities is expected at the forest-steppe zone and at the forestlands border in the northern part of Ukraine. At the same time, an existing government program aimed at enlarging the total area of forests may be considered as a positive factor. Generally, protection and preservation of the local wetlands along with rational, balanced forest management should be the key to successful conservation of the current Short-toed Eagle population in the country. a special treatment of nesting tree trunks with turpentine against martens have been performed for some pairs at the beginning of July starting from the summer of 2014. There is an opinion that all in the nature is balanced by itself, and the special protection of nesting trees against martens is an unacceptable interference in the wild. This could be valid if the wild is really intact and there is no negative impact on rare birds from human activities. In reality, the situation is opposite. The majority of regions of northern Ukraine are under strong pressure of human activities. Consequently, the natural links are already unbalanced in varying degrees. In addition, such protection cannot significantly affect to the well-being of local marten species, although, has a chance to compensate in some measure the negative human impact on the Short-toed Eagle population. That is why such intervention in the natural processes may be considered as reasonably justified. Though, this can artificially increase the reproduction rate for the controlled pairs compared to the entire population. Among regularly controlled pairs, two have their breeding sites in forests intensively visited by humans. However, their reproductive output in fledglings per year is very different: 0.11 for 9 years vs 0.86 for 7 years. Besides, the second pair is nesting within the parkland of the Kiev city and, in general, has apparently worse foraging grounds within its home range. As the breeding failures of those pairs are caused by diverse reasons, none of which can be selected as main, it is evident that the observed difference in the breeding success is defined by some unknown individual features of the birds. More pictures of indexed birds are represented in the galleries (without lowercase letters indexing sexes). special individual signs, as shape of body, head, beak and sort of “facial features”. Usually, a complex of visual characteristics, as well as repeated individual habits and behaviour described below, allow to be confident in the correctness of identification. The repeat identification, in its turn, allows to gather data of special interest, including details and individual variations of behaviour, partner replacements and their consequences, relation of individuals with territory. 5 different adult territorial males and 5 females have been identified individually each year for 7-12 years. Currently, the total number of well recognizable Short-toed Eagle individuals is 15. According to observations, the frequency of “festoon” flight performance widely varies among males. It was observed from time to time performed by certain females and never by others. Though, numbers of territorial conflicts are comparable for all monitored sites. Performing “festoon” display flight with a half-swallowed snake in his beak at the beginning of breeding season is a typical individual behaviour only for 1 out of 5 identified Short-toed Eagle males. 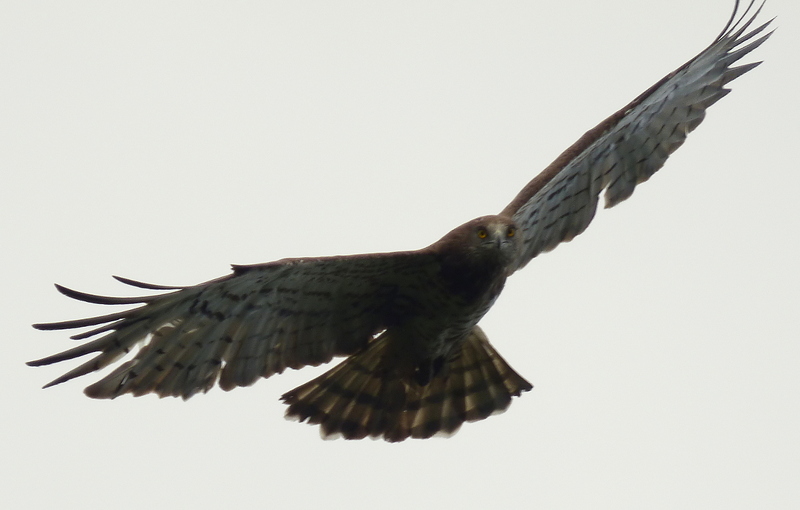 Definitely, this does not mean that other birds never perform “festoon” flights or never do it with prey. However, the inclination and manner to perform that flight distinctly vary among them. Might this be defined by some external local factors or only by individual features of the birds? Currently, the second idea seems to be more probable. One more behaviour is regularly observed and well expressed in certain Short-toed Eagles and never in others. It is motivation of juveniles to chase up parents with prey. One adult male teases his flying fledglings, perching with prey not far from, and taking off each time when a juvenile comes near with begging screams. He is doing it for almost an hour. Significant efforts are required to get prey from the parent. Even though the behaviour is typical for that male and repeats from year to year, it has also been reported only for one more female and never for any other controlled Short-toed Eagles. As in the previous cases, there are no visible objective reasons for the revealed difference in interactions between adults and juveniles. individual hunting techniques, as hunting from perches at small open patches inside forests, from power line wires instead of pylons, in close vicinity to human buildings etc. Among 5 territorial pairs all members of which are identified, 2 birds have been recently replaced. In 2016 a new male (A16m) took place of another one (D11m) of the pair (D11m+A13f) with the lowest reproductive output, equal to 0.14 fledgling per year. The old partners managed to rear only 1 fledgling since 2009. However, hopes for further successful breeding have not come true. A new nest was built that year, but there was no chick in it in July. The same eyrie was successfully occupied in 2017. It remained after the winter, however, fell off the pine in August. The fledgling died, being almost ready to leave the nest. That failure was caused, judging by all, by a strong rainstorm in July. After that, the nest started to glide down on pine branches. Ultimately, the general reproductive output for that female with 2 different males declined to 0.11. The old large female was repeatedly observed in “festoon” flight, as well as bringing prey to the breeding site in spring. May she tend to play the role of a male, and may this impede successful breeding? A female (A11f) was replaced in another pair (B11m+A11f). That pair revealed the reproductive output of 0.64 for 11 seasons. The new female (A17f) was seen for the first time in April 2017. Probably, it was a relatively young bird. At least, a pattern of dark marks in her plumage looked variegated, as if the plumage was not yet final but rather changing. However, the birds had occupied the same nest as in 2016 and successfully reared a fledgling. Although, the new female was regularly observed outside the nest during the incubation period, she took an active part in feeding the chick. Thus, replacement of partners happened quickly, successfully, without nest change. While, nests of that pair have been changed in 60% of the seasons. Continuing the previous topic, the following observations should be described. 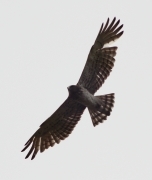 On September 3rd, when both the parents, B11m and A17f, were actively feeding the fledgling at their breeding site, one more adult Short-toed Eagle was photographed in flight there. Neither the male nor new female expressed any aggression towards that bird. Their behaviour looked like they just intended to lead the intruder away from the juvenile. Unfortunately, taken pictures did not allow to identify the old female A11f with complete confidence. However, such visual characteristics as body shape and general colouration matched. Moreover, her appearance at the breeding site at the end of the current breeding season had been predictable if she was alive and going to return to breeding in the next year. The similar situation was recorded for the first changed pair of D11m/A16m and A13f. 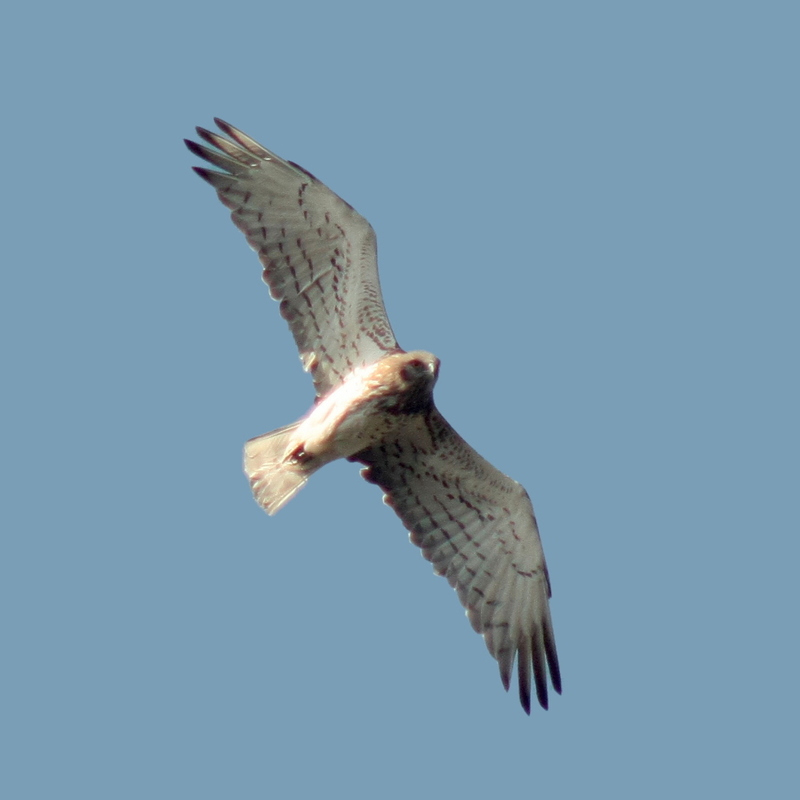 A bird very similar to the old male D11m was photographed by a local birdwatcher on September 28th, 2016 flying at the Desna River floodplain – a traditional hunting area of that pair and, at the same time, a migration path of Short-toed Eagles, and then, within a kilometre from the nest on June 4th, 2017. Currently, it looks like both the old Short-toed Eagles survived and retained relations with their territories after replacement with new birds in the pairs. Though, this assumption first needs to be confirmed, it opens a wide range of topics to investigate. After the death of their chick in July-August 2013, well distinguishable adult Short-toed Eagles A11f and B11m were photographed at their foraging grounds on September 11th. They flew a lot, preparing for autumn migration, and defended the territory from other migrating Short-toed Eagles. May it be true that Short-toed Eagles, whose territories are located on traditional migration routes, start their migration later even after unsuccessful breeding attempts, under the influence of territorial competition? 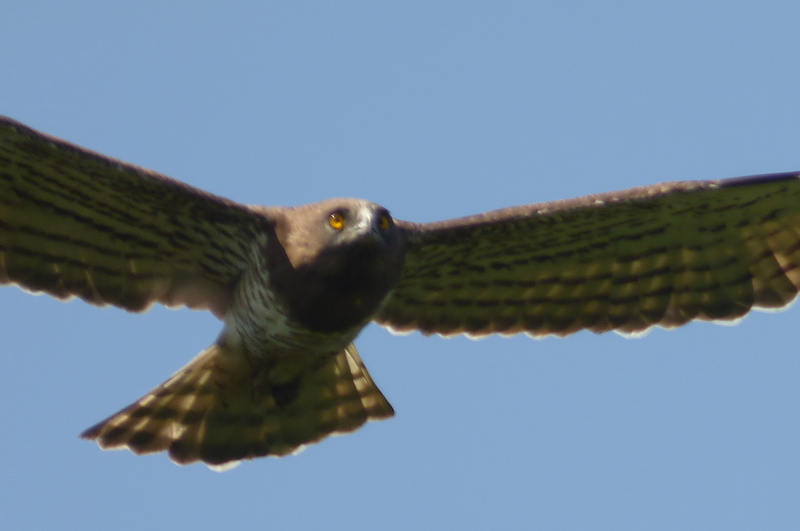 focusing on the diversity of individual features of Short-toed Eagles allows to reveal all the complexity and plasticity of their behaviour, which are the key to survival in the rapidly changing world; also, this approach promises the pleasure of unlimited development of knowledge, even in such, at first sight, a narrow field of wildlife exploration. We would like to express our deep gratitude to Bernard JOUBERT and Gábor PAPP for regular meaningful discussions of current observations, as well as to late Yves BOUDOINT for the initial idea to provide long-term individual identification of Short-toed Eagles by regular photographing them at breeding sites*! Also, some important observations were made possible thanks to Andriy SIMON. * – La Plume du Circaète 6, p.13.